When I was working, I rarely watched TV. Maybe one or two hours a day at best. Name any hit show of the past 10 years and chances are, I missed it. Being the blue-collar egghead I am, I believed that most TV was crap. Now, during my unexpected "sabbatical," I've had more time to channel-surf and I've found that I was wrong. Nearly all TV is crap. Still, there are a few grains of wheat among the chaff. Last night, I came across the Independent Film Channel, a basic cable selection that's easily forgotten, like the Sci-Fi Channel or C-SPAN, unless you're into that kind of stuff. The screen was filled with the image of a man's head and shoulders silhouetted against a blood-red background. The man started to speak and, even though his face was obscured, I recognized him instantly. It was the late actor/monologuist Spalding Gray. Yeah, I know. The Web is full of tributes and remembrances (A quick Google search can fill in the uninitiated). This isn't one of them. I had been a Gray fan while I was in college, but I hadn't followed his career much since then. After his suicide in early 2004, I purposely distanced myself from his films and books. You see, I didn't want to join the "Church of PostHumous Appreciation." You're either a member or you ain't and you very well know it. The CPHA, which has no central headquarters, no written charter and no members' list, inevitably pops up in the wake of a famous artist's death. I've witnessed the CPHA in action 3 times myself. 1.) In 1973, in the form of a Goldblatt's salesman who pushed a Jim Croce record into my puzzled grandmother's hands. Buy it, he urged her, because it would be "worth something someday." 2.) In 1995, as a retail drone, when I was steamrolled by a group of tearful teenaged girls rushing to buy up every Blind Melon ("No Rain" and the Bee Girl, remember?) CD on shelf because the lead singer OD'd on cocaine. 3.) Earlier this year, in the guise of a friend who ordered a copy of Hunter S. Thompson's Fear and Loathing in Las Vegas. Why, I asked him, did he want to read the book now, when he never expressed interest in any of Thompson's works when the author was alive? "Are you kidding?" he said. "Because Hunter S. Thompson was a genius, that's why!" CPHA members, all of them. After the hoopla subsides, the CPHA disappears as quickly as it appeared. Who knows where these people go and what they do with all those records, CDs, books, etc.? Who knows if those things are ever "worth something," beyond personal worth? What changes the value of an artist's output, simply because the artist dies? Why run out and anxiously snap up stuff you wouldn't have touched the day before? I didn't get it and wanted no part of it. It weirded me out, frankly. I didn't buy any new Spalding Gray videos or books. The ones I had remained untouched. The film IFC was playing that night was "Gray's Anatomy (1996)," directed by Steven Soderbergh. In summary: Gray discovers that one of his eyes is afflicted with a degenerative disorder that can only be corrected by surgery. Extremely scalpel-shy, Gray tries to avoid the operation by seeking out "alternative cures." This search takes him to the clinic of a New York nutritionist, a Native American "sweat lodge" and to the operating table of a Filipino "psychic surgeon," among other options. No, I won't spoil the ending for you. I had seen "Gray's Anatomy" once, years before. But honestly, I didn't want to watch it again. It's not that "Gray's Anatomy" is a bad film. It doesn't trump his masterpiece, "Swimming to Cambodia (1987)," but it comes close. I didn't want to see it again because listening to Gray talk about health, sickness and mortality would remind me of his 2001 car crash, in which he sustained the severe head and foot injuries which ultimately led to his suicide. I didn't want to go there. I was ready to change the channel. But I didn't. I watched the rest of the film, because Spalding hooked me again. What struck me first was that this wasn't some college fixation of mine, like Winona Ryder or Hootie and the Blowfish. You know, stuff that leaves you wondering what you were thinking 10 years later. No, his voice was for real. His voice had an Everyman quality to it, like he could be your neighbor in the next cubicle or someone one restaurant booth down from yours. Still, the voice also had a uniqueness to it, a trait that would make you lean out of that cubicle or booth to hear what he was saying. It's what kept me watching that film. 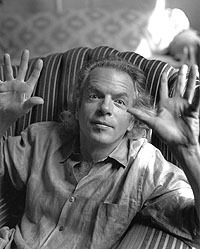 In addition to his voice, Spalding Gray was a damn good storyteller. In this monologue, there was drama, but it was mixed with enough humor to balance it off, like coffee and cream in a just-right cup. The humor was sharp but never vicious, and usually directed at himself. He addressed well-known topics that, through his eyes, appeared radically fresh. The monologue, despite its structure and focus, sounded as casual and effortless as dinnertime conversation. Friends, these are skills that are born, not made, and only sharpened through years of effort. Above all that, there was familiarity. Gray made his audience feel like he was talking to them one-on-one. It seemed like he was confiding in them. Did you have problems, phobias, or even neuroses? Did you make mistakes or go on wild goose chases? That was okay, Gray said, because so did he---and then some---and that didn't stop him from getting to where he needed to be. Spalding Gray, through his art, made his audience feel less flawed and less alone. As the credits rolled on "Gray's Anatomy," I finally figured out the CPHA. Why did they run out and buy up all of a dead artist's work? To preserve the sense of intimacy the artist created through that work. Because there isn't going to be any more of that work (no, goodies unearthed from "the vault" don't count). Or maybe out of puzzlement due to a larger question that can't be answered. Why are the artist's gifts that sustain us, the audience, not enough to sustain the artist himself? lol - very nice review of Gray's Anatomy. someone on spaldinggray. com posted the link on the guest book. As co webmaster of spaldinggray.com, i would like your permission to post your comments in the review section. please let me know if we can post your review - just click contact on the web site. yes John as I recall I got your email about gray's anatomy and i think we posted it on the site. email me at uptonatom@hotmail.com if i missed something here. sorry but i get a fair # of emails about Spalding so sometimes it's hard to keep track and remember.